First up was the Peter Thomas Roth Max Complexion Correction Pads, which are soaked with 10% glycolic acid and 10% salicylic acid. These two ingredients combined promise glowing, healthy, exfoliated skin and aims to keep blackheads and blemishes at bay. I've started off by cutting the pads in half to get the most out of them (and the price tag, which is in all fairness, semi-reasonable), and use them twice a week (Tuesday/Saturday). I recommend you cutting any pre-soaked exfoliating pads in half too, as I really cannot understand your skin needing all of the product soaked onto one large pad. So far, promising results. Any build up of dead skin cells is diminished, and the tingling sensation always makes me think these must be getting to work. It's too soon to say whether or not these really are brilliant, so I'll report back to you once I've worked my way through the majority of the tub. Next up we have the Aesop Oil Free Facial Hydrating Serum. Immediately I fell in love with this. It's so fast absorbing, has a lovely, herbal and clean natural fragrance and has been hydrating my skin beautifully, without leaving it feel greasy. This came with a hefty price tag, however it's an absolutely ginormous bottle and only two-three drops is necessary. This will last me a while, which I'm more than happy with as it's sitting very chicly amongst my daily skincare grabs. I've heard many things about Aurelia as a skincare brand, and they've greatly interested me with their USP being they specialise in probiotic infused skincare. My beloved Origins moisturiser drew it's last drop so I opted for the Aurelia Cell Revitalise Day Moisturiser as its replacement. This seems small in size but it's hefty in weight, and is a very creamy yet light moisturiser. It doesn't feel too rich for my oily skin and only a tiny amount is needed to absorb quickly into the skin, hydrate and protect my skin and provide a velvet finish base. Again, this is pricey (thank God for that discount code! ), but so far it seems well worth the money. Finally, the Pro Hygiene Collection Antibacterial Make Up Brush Cleanser was something that I bought rather spontaneously. I get a little fed up having to use the same eyeshadow palette as my brushes are already coloured in certain shades. I've made a significant dent in the Charlotte Tilbury Dolce Vita palette's champagne colour which is my everyday lid colour, but hate seeing it disappear from the palette on a daily basis. This make up brush cleanser, however, is fantastic for quickly cleaning my brushes, and dries very quickly too. It now gives me so much more freedom as to what colours I reach for daily. But don't stress, I'm still regularly deep cleansing my brushes too! So that's my bank account nicely emptied for the time being, and my skincare stash nicely re-stocked. I'll get back to you on how I get along with these products, however I wanted to share with you my initial opinions. After all, first impressions mean everything! 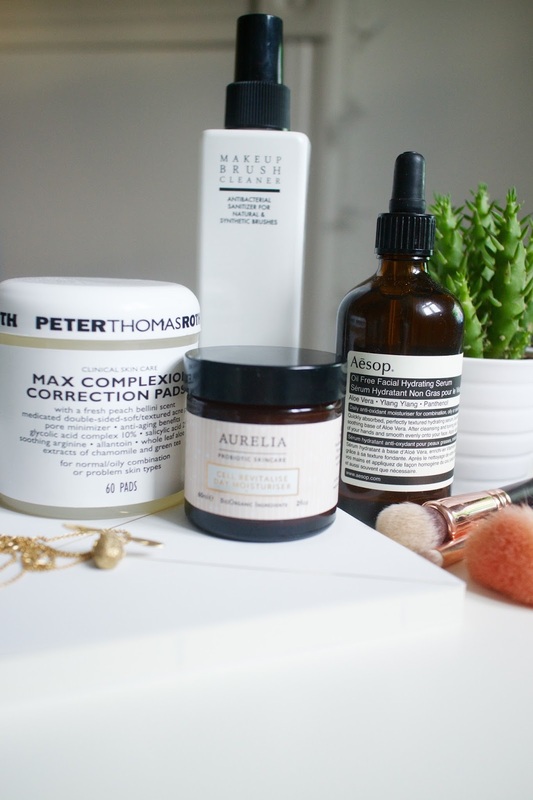 Have you purchased any exciting beauty products recently? What's your favourite thing to splurge on? Do you prefer make-up or skincare?